Sonic 1 and 2 is a hack of Sonic the Hedgehog 2 for the Sega Mega Drive by ColinC10, submitted as his entry for the 2010 Sonic the Hedgehog Hacking Contest. 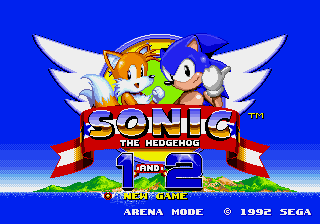 In addition to all Zones usually featured in Sonic the Hedgehog 2, this hack first features all Zones from Sonic the Hedgehog (16-bit), which have been ported, resulting in a continuous game experience from Green Hill Zone to Death Egg Zone. Both games' different kinds of Special Stages are available in all regular acts, and they are accessed through their usual method (Giant Rings for Sonic 1's, star post checkpoints for Sonic 2's). The player must beat all special stages from each game, thus collecting 13 Chaos Emeralds, in order to obtain Super Sonic. announced the project once development was well underway. 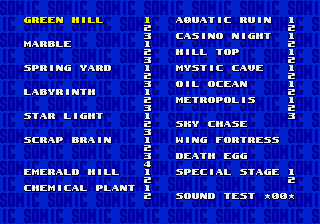 A full game of Sonic 1 and 2 starts in Green Hill Zone and ends as Sonic or Tails destroys and escapes from Death Egg Zone. Sonic 1’s Final Zone has been renamed to a second 3rd act of Scrap Brain (even though it is listed as Act 4 in Level Select) as it is obviously no longer the final zone. A normal act ending has been added to Final Zone just as if was any other zone. No ending is shown for Sonic 1; gameplay proceeds immediately to Emerald Hill Zone as though this battle with Robotnik were simply a normal boss battle. The Special Stages from Sonic 1 are available (assuming, as normal, that Sonic has at least 50 rings) through Giant Rings at the end of every non-boss Act, now including those of Sonic 2, until Sonic has collected each of their six Chaos Emeralds. Scrap Brain Zone now has Giant Rings. Conversely, Star Post checkpoints in the Sonic 1 levels have been changed to those from Sonic 2, enabling the entry of Sonic 2’s Special Stages from levels of either game (again, assuming 50+ rings). The player needs all six Sonic 1 emeralds and all seven Sonic 2 emeralds to become Super Sonic. Progress is automatically saved to SRAM. It is possible to enable/disable this, or start a new game, from the options menu. Said menu also now enables the player to resume from the latest-accessed act with a different selection of character(s). Arena Mode: Attempt to increase your rank by completing time attack challenges. Higher ranks mean harder levels and shorter time limits. If both Sonic and Tails are on screen, and there are a large number of objects active, the framerate can drop somewhat. This is most noticeable in Sonic 1 levels, which is to be expected as the original game did not make any consideration of Tails and the consequent increased number of sprites. ColinC10 had to implement a lot of trickery to circumvent palette limitations, so some slight differences from the original games may be noticeable. When playing a Sonic 1 zone, Z80 Sonic 2 driver changes to 68k Sonic 1's one. This page was last edited on 27 March 2019, at 13:43.